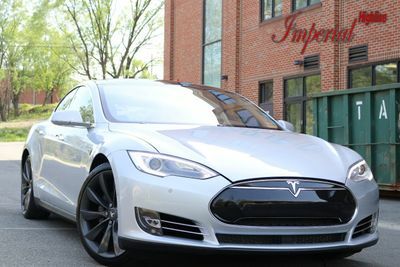 This 2014 Tesla Model S 85kWh is now available for sale through Imper Highline! This is a 1 Owner vehicle and has a Clean and Clear CarFax Report! It comes fully detailed by our professionals and has a ton of features such as Navigation, Heated Seats, Power seats, Reverse Camera, Air suspension, Panoramic sunroof, AutoPilot, AutoPark, 21 inch Alloy wheels and much more! Setup an appointment to view this beautiful vehicle before its gone! THIS BEAUTIFUL TESLA HAS ALMOST ALL THE OPTIONS, AUTO PILOT***AUTO PARK**LANE ASSIST**SPEED ASSIST***COLLISION AVOIDANCE ASSIST**AUTO SUSPENSION**PANO ROOF**HEATED SEATS**SUPER CLEAN, RUNS AND LOOKS AMAZING, FOR MORE INFO PLEASE CALL OUR SALES DEPARTMENT AT 703-368-7777, IF YOU NEED FINANCING PLEASE FILL OUT CREDIT APPLICATION ON OUR WEBSITE WWW.IMPERIALHIGHLINE.COM.